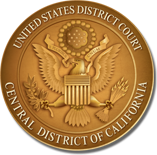 Courtrooms in the United States District Court for the Central District of California have DVD/VCR equipment and an Electronic Evidence Presenter (sometimes referred to as an "ELMO") for attorneys to use when presenting evidence at trial or evidentiary hearings. Counsel may also present evidence via their own laptop computers. The Court's Electronic Evidence Presenter can project the images of exhibits (documents, photographs, negatives, objects, x-rays, fingerprints, transparencies, etc.) to one or more monitors that permit the judge, attorneys, witnesses, and jury to view the images at the same time. It also allows the operator to zoom in and highlight the most critical areas of the exhibit. Other features include a touch-sensitive monitor at the witness stand that allows the witness to use his or her finger to "write" in different colors on the projected image and a touch-sensitive monitor at the courtroom lectern that allows the person operating the Electronic Evidence Presenter to mark up the projected image and to view it at close range. (These touch-sensitive screens are extremely sensitive and should be used with care.) Please be aware, however, that the Electronic Evidence Presenter is a visual presenter; it cannot be used to play any form of audio recording. Only the person operating the Electronic Evidence Presenter can control the image that appears on the courtroom monitors. The judge and courtroom deputy, however, control whether that image is displayed to the jury. Counsel must confer with the judge as to what evidence will be shown on the equipment prior to its display. In the event the Court's equipment malfunctions, do not attempt to troubleshoot the problem, but inform the courtroom deputy, so that he or she may contact the Audio/Visual department. Please contact the courtroom deputy to schedule a test of any documents, objects, or videos on the Court's equipment one to three weeks in advance of its use, but no later than three days before its use in any court hearing. Training on use of the Court's evidence presentation equipment is available and will be conducted in the courtroom if available. For Los Angeles, reservations for training sessions are on a first-come, first-served basis and should be made as soon as possible by calling (213) 894-3061. For the divisional offices, arrangements must be made through the courtroom deputy. The Court's equipment also allows attorneys to use their own laptop computers to present evidence. Attorneys, however, must provide their own technical assistance in preparing such presentations. The Court is not responsible for troubleshooting compatibility issues arising from equipment (e.g. laptops, touchpads) not supplied by the Court. Finally, due to the sophisticated wiring for the Court's Electronic Evidence Presenter, attorneys are advised not to bring in their own visual presenter equipment, but to use the equipment made available by the Court.